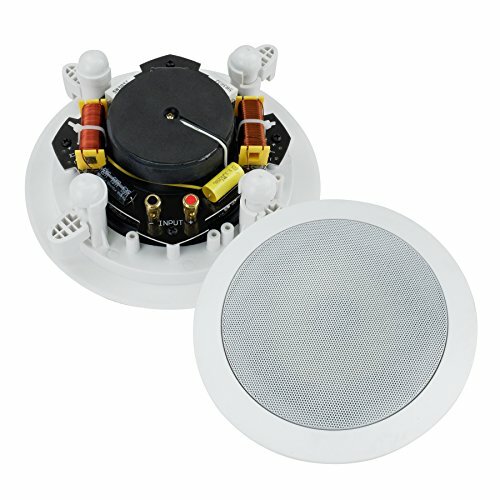 The 2-way in-wall/in-ceiling speaker for home theater system delivers rich sound to your room without real possession of any place. The silk dome tweeter delivers a clear sound and a poly woofer capable of robust bass output. Right out of the box it is ready to get installed. Screw driver is not included in box. Built-in 90 degrees rotary installation tab, very easy to install, automatically grabs onto surrounding wall/ceiling securely. Advanced crossover network design ensures coherent transition in the upper critical upper mid-range area. Metal grille could be removed easily if you want for later cleanup.